Ralph Peters’ Civil War Insights – Part 2 | Armchair General Magazine - We Put YOU in Command! Horse artillery 1865. Werner Company lithograph, 1899. 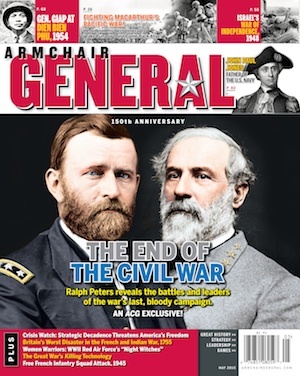 During the 150th anniversary month of the end of the Civil War acclaimed strategist and best-selling author Ralph Peters shares his superb insight on America’s bloodiest conflict in ArmchairGeneral.com’s exclusive 3-part article series. One part will appear each week for three weeks in April 2015. In Part 2 he examines command and control issues. Click here to read Part 1. Our Civil War has haunted me for over a half-century. Since childhood, I’ve read about it and visited every battlefield I could. Later, I studied it seriously and taught it to fellow military officers. Then I wrote novels about it. I’m still writing and still learning: The Civil War is inexhaustible, with new sources of information still emerging. Along my pilgrim’s path, I’ve met some surprises and some of my initial beliefs have changed—usually notions based on “common knowledge” that wasn’t very knowledgeable. So as we commemorate the 150th anniversary of the conclusion of that still-echoing war, I’d like to share a few insights—none of which were on the mind of the nine-year-old boy whose father took him to the centennial reenactment of First Manassas. When judging generals, we overlook what they suffered. In the summer of 1864, while facing Grant and Meade in the horrific Overland Campaign, Lee endured angina, rheumatism, severe indigestion and chronic diarrhea. That same summer, Union Brigadier General Francis Channing Barlow soldiered on with dysentery, a tormenting fungal infection of his feet, intermittent toothache and the pain of barely healed wounds (plus, his wife died unexpectedly). Major General Winfield Scott Hancock’s Gettysburg wound oozed bloody pus and pained him so terribly a year and a half later that he had to relinquish command. James Longstreet, John Gordon, Wade Hampton, John Bell Hood, Richard Ewell and many another Confederate suffered severe wounds or even lost limbs, but came back to fight again—as did many of their Union counterparts. What’s striking today is how stoic those men were, how much pain they endured in the years before the appearance of so simple a drug as aspirin. Mix in the constant exhaustion and the heartbreaking loss of children far from the battlefront—losses suffered by men as diverse as Lincoln and Davis, Longstreet, Hampton and Rutherford B. Hayes—and we begin to get a sense of the burdens under which these men labored. Sick, in pain, exhausted and bereaved, they stayed by their flags until they could not go on (Barlow collapsed and had to be carried from the front on a litter). If those commanders made imperfect decisions amid war’s confusions, perhaps we armchair generals should be more understanding of their predicaments: It isn’t noteworthy how much they got wrong, but how much they got right. Officers of the 3d Pennsylvania Cavalry. Library of Congress. War does belong to the young. At the outset of the war, the military professionals, north and south, disdained the eager-but-naïve volunteer officers who rushed to put on uniforms and preen. But as the war progressed and talented volunteers became seasoned veterans, these volunteers and the youngest, “unspoiled” graduates of West Point emerged as the innovators. With rare exceptions, such as Grant and Sherman, the older professionals fought in Napoleon’s shadow. The younger generals created modern war. Other than Grant and Sherman, with their fresh strategic visions, and Major General Andrew A. Humphreys, who created the first modern staff for the Army of the Potomac, not one officer over the age of thirty-five contributed a revolutionary development. Men in their early twenties to early thirties, such as Emory Upton and Philip Sheridan, changed the battlefield. In fact, they changed it so forcefully that European observers couldn’t accept what they saw and repeated the Pickett-Pettigrew Charge on a massive scale on the Western Front. Neither were the younger men bewitched by misleading recollections of the Mexican War, which was fought at short-range with smoothbore muskets and under-developed artillery. Nor were Northern officers obsessed with chivalry and honor to the crippling degree afflicting their Southern counterparts. Once the “new men” realized how little their superiors really knew, they reinvented war on the battlefield (and we shouldn’t forget naval innovations, either). Meade and Humphreys, not von Moltke, developed the finest field staff of their century. The U.S. Army should be far prouder of the magnificent Army of the Potomac staff built by its chief of staff, Major General Andrew A. Humphreys (who would have preferred to return to division command) under the guidance of the army’s commander, Major General George Gordon Meade. Although essentially co-located from the spring of 1864 to the end of the war, Grant’s higher-echelon staff was more a collection of commissars, of spies and enforcers peering over the shoulders of field commanders. Humphrey’s staff was technically expert and disciplined (Humphreys’ tart tongue made certain of the latter). Rigorously shaped over the autumn of 1863 and the subsequent winter, Humphrey’s staff matured under the constant stress of the Overland Campaign and pulled off a feat—the crossing of the James—that combined breathtaking boldness, brilliant engineering and a uniquely successful operational deception. Staged under the nose of a misled enemy, that crossing would not be rivaled by any army for eight decades, until the great Eastern Front assault crossings and, not least, the U.S. Army’s crossing of the Rhine. By the final seasons of the war, the Army of the Potomac staff had mastered logistics (with vast stockpiles of supplies and railroads running to corps and division rear areas). Faced with massive casualties, the staff’s organizational abilities compensated for a pronounced decay in troop quality. And contrary to the image of Civil War medicine as sheer butchery, medical services became astonishingly capable compared to other contemporary armies and the evacuation of casualties from the tactical level to the strategic rear could happen at a speed no European army matched until well into the Great War (Russian forces would not achieve it until they fought in Afghanistan in the 1980s). Those who idolize all things Prussian and German should look hard at the Austro-Prussian War of 1866, which the Prussians won largely thanks to Austrian incompetence and in the course of which Prussia’s advancing armies promptly outran their commissaries and medical support while operational communications collapsed. Prussian chief of staff Helmut von Moltke (the elder) “lost” one of his three converging armies for several days until it abruptly appeared late on the day of Koeniggraetz and turned the tide. Von Moltke’s vaunted staff could do no more than watch events unfold. In the field (as opposed to its Berlin offices), that staff was not nearly as modern, capable and agile as that of the Army of the Potomac by the war’s last year. A bust of Humphreys should have pride of place in the halls of the U.S. Army Command and General Staff College, but few American officers ever hear of him. Signaling by torches across the James River at night, Oct. 1864. Illustration by William Waud. Library of Congress. The missing link was effective tactical communications. No matter how effective the staff work or how strong the leadership, once troops were engaged in combat, control broke down. The Union Army, especially, was becoming a modern war machine, but lacked one key feature of truly modern militaries: tactical radios, which would not enter general use for well over a half-century. Those armies in blue and gray had to rely on age-old means to effect what control they could amid the smoke and clamor of battle, but the flags, bugle calls and drum rolls were insufficient to prevent combat from collapsing into tactical confusion. Once soldiers entered the literal fog of war—the miasma of gun smoke, accompanied by the roar of cannon and musketry—tactical commanders could do little more than keep up and keep shouting. From Bull Run to Hatcher’s Run, division commanders routinely lost control of subordinate formations once the shooting began. The nature of most American battlefields aggravated the problem. In Europe, for centuries field marshals had agreed that battles should be fought on open ground where troops could be deployed in mass and efficiently. In America’s Civil War, though, few battlefields were as open as the central terrain at Gettysburg, where the Pickett-Pettigrew Charge was a raucous Rebel emulation of the oblique attacks of Frederick the Great. Instead, our battlefields tended toward broken terrain and, often, limited visibility: Shiloh, Chancellorsville, Chickamauga, the Wilderness, Spotsylvania … even the ground on the flanks at Gettysburg was far more typical than the open fields that invited such carnage at Fredericksburg. Right through the end of the war, tactical couriers went astray and orders failed to reach their intended recipients: The Confederate disaster at Five Forks was largely the result of a “failure to communicate.” Control of units once they were committed remained the problem that neither side could solve. This concludes Part 2 of Ralph Peters’ three-part article on the American Civil War. Part 3 will appear next week. Ralph Peters is the author of the prize-winning Civil War novels Cain at Gettysburg and Hell or Richmond, as well as of the new novel, Valley of the Shadow, which recreates the struggle between Sheridan and Early in the autumn of 1864. A long-time member of the Armchair General team, Ralph is a former enlisted man and a retired Army officer who now appears as Fox News’ Strategic Analyst. Another excellent,and very informative entry. Thank you Col. Peters! These are great points to ponder.. Popular history doesn’t always dig deep enough. Peters mentions above that von Moltke “lost” one of his armies for three days just prior to the Battle of Koniggratz, citing this as a reason to have a lesser regard for Herr Moltke’s reputation as a general staff officer. Not knowing much about the Austro-Prussian War of 1866 I searched for details about this campaign and especially Peters claim about losing an army. No success. I even located a paper by LTC Charles Daves done at the US Command and General Staff College (link) but this study makes no reference to a lost Prussian army. Any readers here who know what Peters is talking about or does Peters not know what he is talking about? And don’t forget, practice makes perfect. The Army of the Potomac didn’t have such great a staff in the weeks of the war, or even the first months. It took time. The Austro-Prussian War lasted only just over two months.